It is hard to write impartial book review when you are the author of the first one, technical reviewer of the second one and really like the third book, but I'll try my best with this post. 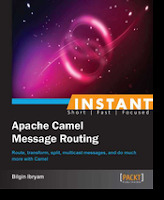 Recently I blogged about my Instant Apache Camel Message Routing book. It is a short book intented for new comers to Apache Camel, showing quickly, how to create messaging applications in Camel using Enterprise Integration Patters. In this book I tried to distile and put the most important bits and peices about Camel and most commonly used integration patters. So there is no fluff, no repetion, only 50 pages of Camel integration crush course with examples and diagrams. If you want to get a high level view of Camel and EIPs, without diving into the details, that's the book to read. 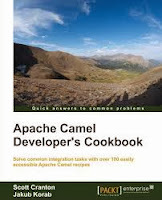 The other new Apache Camel book that is expected by the end of this year is called Apache Camel Developer's Cookbook by Scott Cranton and Jakub Korab. It is a lookup guide full of recipes for everything you might want to do with Camel. It provides around 500 pages of best practice tips for using Apache Camel and lots of examples. I enjoyed reviewing it and even learned some new useful tips. If you prefer learing with examples, this cookbook is a must have. And there is of course the famous Camel in Action by Claus Ibsen and Jonathan Anstey. It is a book which I started learning Camel couple of years ago and I still read some of the chapters from time to time. If you want to learn the philisofy behind Camel and find out how Camel internals work this is the book. A must read before putting #Camel on your CV. I cannot stop myself mentioning the Bible of Integrations, the Enterprise Integration Patterns book by Gregor Hohpe. This is not a Camel book, but it lays down the foundation of Enterprise Integration Patterns which Camel implements. The book's website is a great pattern reference with use cases and diagrams. It is a huge book (with more than 700 pages), but a good to have as a reference for any team. You might be surpised to find out that there is pattern for everything. In short: if you want to discover what is Apache Camel and how to use EIPs without going into the internals go for Camel Message Routing book. If you want to see lots of example recipes and tips, go for Camel Cookbook. 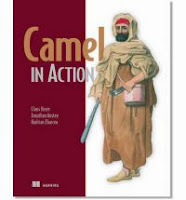 And if you want to deep dive into Camel go for Camel in Action. PS: When I created this post there were three Camel books, but by the time I decided to publish it there were four already. A really productive year for the Camel community. 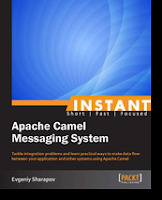 The fourt book in my list is called Instant Apache Camel Messaging System by Evgeniy Sharapov. It is another short book, intented for beginners that emphsasys on test driven approach for writing Camel applications. I haven't read the book, but Claus Ibsen did and posted a review here. Choose a book, read it, and hack something.